National-Desexing-Month-Campaign | East Bentleigh Animal Care. 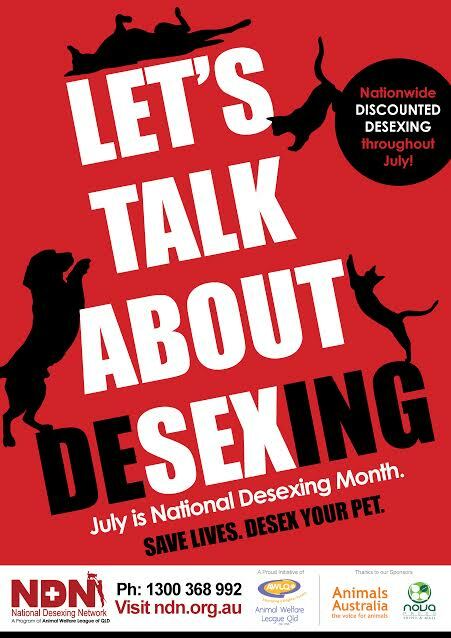 We are involved in the National Desexing Network’s Desexing month, so prices for desexing only are 50% off. This includes the desexing surgery, pain relief and the follow up consultation to check the animals health and healing, and take the stitches out. With desexing procedures we highly recommend preanaesthetic blood profiles and intravenous fluids to reduce the risk of the surgery and speed up the recovery of the animal, and also a buster collar to make sure the animal doesn’t lick or bite at the wound so it heals faster. These last 3 things are not included in the reduced pricing, any extra medications are also not included.